The Bale Mountains National Park is home to 78 species of mammals. Check out our large and/or commonly seen mammal identification table here. Ethiopian Wolf. Photo by Martin Harvey. 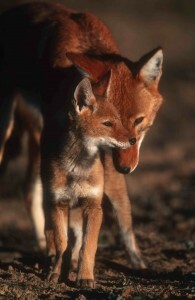 The Ethiopian wolf is the rarest canid in the world, and Africa’s most threatened carnivore. The closest living relatives of the Ethiopian wolf are grey wolves and coyotes. The Ethiopian wolf ancestor crossed over from Eurasia during the Pleistocene period less than 100,000 years ago, when sea levels were lower and Africa and the Middle East were connected. At the time, the highlands of Ethiopia were predominately Afroalpine grasslands and heathlands, and these habitats were ideal for many small mammals, particularly grass rats and molerats. This Afroalpine environment and its abundant rodents drove the Ethiopian wolf evolution morphologically into a specialized rodent hunter with an elongated muzzle, long legs and a distinctive reddish coat, with white markings and a darker tail tip. Male Ethiopian wolves weigh between 14 and 20kg, while the weight of adult females ranges from 11 to 16 kg. Ethiopian wolves live in packs of between 2 and 18 animals, which share and defend an exclusive territory. Unlike most social carnivores, Ethiopian wolves forage and feed alone during the day. In Bale they are mostly visible foraging or walking early in the morning and late in the afternoon, and occasionally in small groups, greeting or scent marking along their territory boundaries. Dens are only used during the short breeding season by pups and nursing females. The rest of the pack sleeps in the open but helps protect the den from predators and contributes food to the pups. The Ethiopian wolf is restricted to just six isolated mountaintop areas of the Ethiopian highlands. With a total world population of between 400 to 520 individuals, it is highly endangered. As a result it is legally protected in the country from any activities that may threaten its survival. Rapidly expanding cattle and crop farming are severe threats, as well as diseases such as rabies and canine distemper transmitted from domestic dog. Diseases transmitted from domestic dogs have recently caused population crashes in the Bale Mountains. Mountain Nyala. Photo by Delphin Ruche. The mountain nyala was the last large ungulate to be discovered in Africa. They are found only in Ethiopia, south of the Rift Valley. Once widely distributed in the southeast highlands of Ethiopia, their range and population have suffered a dramatic decline over the last several decades due to habitat loss as a result of agricultural expansion and killing. 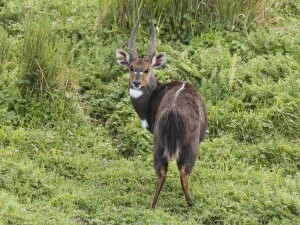 There are approximately 3,700 nyala remaining in the Bale Mountains, 30 – 40 percent of which are found in the park alone. This is the majority of the population with only very small pockets found in nearby mountain ranges. 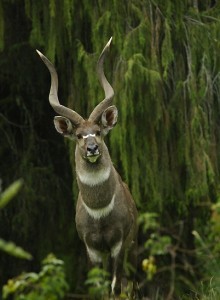 Though more prominent in males, mountain nyala have unique white spots and stripes on their sides. Males typically weigh between 180 and 320kg, while females weigh between 150 and 200kg. When mature, males have a mane of erectile hairs along the spine. Mountain nyala are usually seen in small family groups of females with calves. Calves can be born throughout the year but there is a peak in births between December and March. The calves accompany their mothers for up to two years. At about two years old, females conceive and after a gestation of about nine months, they give birth to a single calf. At the same age, juvenile males develop their secondary sexual characteristics – horns, a dark spinal mane, and the behavior that brings them into conflict with adult males. They usually leave their family group to join ‘bachelor’ groups of other males. They form a dominance hierarchy, maintained between younger males by tussles and in the older males by ritualized, strutting displays. When displaying, their perceived size increases with their erectile hairs. The displays can end in a fierce, brief clash of horns if neither male backs down. With age, male nyala become solitary. The species has a wide ecological zone that ranges from 1,800m to 3,750m. Size, colour and feeding habits vary slightly with altitudinal difference. Females are mainly grazers when grass is available in the wet season and become browsers in the dry season. Males are mostly browsers throughout the year. Their main foods are St. John’s wort, African or wild wormwood (Artemesia afra), Gallium semensis, Hagenia abyssinica, Cape Gold (Helichrysum splendidum), Discopodium spp. and Thistle (Carduus spp). Because grass is not available in the dry season, the mountain nyala move to the woodland regardless of altitudinal difference, in search of food. They rely on the woodland for sustenance, and it is therefore critical for the mountain nyala’s survival. 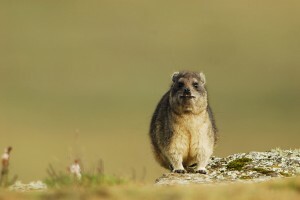 Rock Hyrax. Photo by Vincent Munier. When hyraxes were first classified, they were grouped with rodents because of the superficial resemblance. They were then grouped with elephants because early fossils of both lineages were similar. More recently, these small, dark-colored and tailless animals have been separated to form their own order.Over 25 million years ago, the 11 hyrax genera were among the most successful herbivores in Africa. Now, only three genera remain. They have a poor ability to regulate their temperature and have to warm up in the morning before becoming active. Therefore, this is the best time of day to see them. As early morning sunshine hits the cliffs on which colonies are found, they emerge to sun themselves before setting off to forage. Unlike rodents, they use their large incisors for defense and grooming, while using their molars for biting off and chewing food. Rock hyraxes graze, eating only grass. They can bite off and chew such large mouthfuls of vegetation at a time that it only takes two or so feeding bouts to fill their stomachs. Afterwards, they can have long periods of inactivity lasting up to several days to conserve energy and to digest their food. Uniquely for a mammal their size, hyraxes have a seven-month gestation period; the young are born almost fully developed. They are extremely efficient at conserving water, and during dry periods, their urine is thick and syrupy. Animals in an area use multi-species, communal and extremely pungent ‘latrines’ that can be millennia old. Starck's Hare. Photo by Delphin Ruche. Endemic to Ethiopia, the Starck’s hare is a very important part of the ecosystem in Bale, as well as an important prey for the endangered Ethiopian wolf. 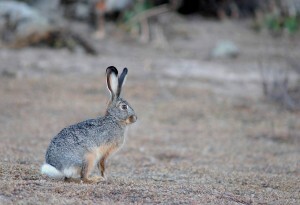 Starck’s hare are found on both sides of the Rift Valley from 2,140m to 4,000m in grasslands and Afroalpine moorlands. The density ranges from about 13 per km2 in the dry season to about 18 per km2 in the wet season. Festica grass is the most important source of food for Starck’s hare. 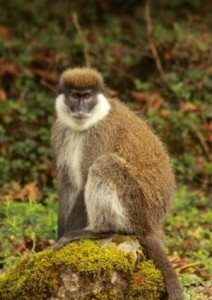 Endemic to Ethiopia, the Bale monkey is distinctive for its white chin and cheeks and black face. They were discovered quite recently, in 1902, hence relatively little is known about their natural history. According to recent findings, the distributional range of the Bale Monkey extends between 2,200m and 3,400m. The primary habitat of the Bale monkey is the montane bamboo forest. They are also found in adjacent habitat types such as the Schefflera- Hagenia belt. Bamboo (Arundinaria alpine) makes up an astounding 77 percent of their diet, though they also forage on the fruits of other trees. Bale monkeys usually occur in clusters. They remain silent at night, but may produce loud calls during the day, mainly to signify the presence of danger. They spend most of their time hiding in dense cover, as they are quite timid. Bale monkeys are thought to be endangered. The main threats to their survival include expansion of settlements and cultivation of land within their range. Thus, there is a concern that such a circumstance may potentially lead to the emergence of conflicts in retaliation for crop raiding. Moreover, fire outbreaks from the adjacent areas (especially heather fire) are a serious threat to neighboring bamboo forests. Rodent. Photo by Delphin Ruche. Almost one third of the 47 mammals found in Bale Mountains National Park are rodents. The rodent community, particularly of the Afroalpine plateau, is a keystone population in the park. They are the natural grazers of the Afroalpine areas, performing important duties of cryoturbation (soil-mixing). At least eight Ethiopian endemic rodent species have been identified within in the park, including the impressive giant molerat. 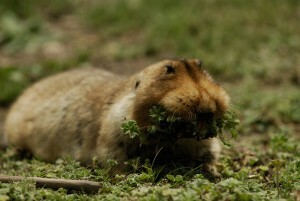 Giant Molerat. Photo by Delphin Ruche. Living in extremely high altitudes of the Afroalpine ecosystem, the giant molerat is endemic to the Bale Mountains. 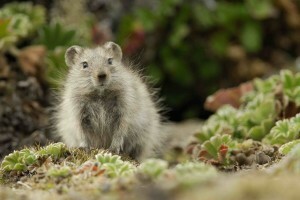 They reach staggering densities on the Sanetti plateau of as many as 5,000 molerats in 1km2. They are most frequently spotted either foraging surreptitiously around the entrances of their burrows, or shoveling soil from a newly excavated hole. Giant molerats are solitary, but their wide-ranging burrow systems overlap with other individuals. Each burrow system includes tunnels of over 90m, covering an area of up to 400m2. There is one functional nest per system, one entrance per nest, and nesting material consisting exclusively of grasses, woven into a hollow ball. In the burrow system, several dead end tunnels are filled with foodstuffs and feces. The systems are often sloped and they use areas on higher ground during the wet season and lower ground during the dry season. The depth of the tunnels controls the temperature and the rodents move around the burrow as a means of thermoregulation. They spend just over an hour a day on the surface, mostly foraging on shoots of plants. So that they can scan for danger without exposing their bodies, their eyes are perched on the top of the head. They extend their bodies cautiously from their holes, but even with these precautions they frequently end up as a meal; they are an important part of the diet of the Ethiopian wolf. The giant molerats are the architects of the Afroalpine region, building rounded domes and continually turning over the soil as they forage. They have a significant effect on the landscape due to their extensive burrow systems and mounds of vegetable refuse and soil. These practices result in more grass growth, increasing suitable habitats for grass rats, mice and shrews, which provide food for the birds of prey and Ethiopian wolves. Menelik's Bushbuck. Photo by Hakan Pohlstrand. Menelik’s bushbuck is an endemic sub-species of bushbuck. The male Menelik’s bushbuck is much darker than the male common bushbuck. Menelik’s bushbuck are most often seen alone, except when adult females are accompanied by their offspring for up to one year after birth. They are not territorial. Like the mountain nyala, the males carry out elaborate strutting displays to establish hierarchies. They have small home ranges of up to 3km2. They are most often found in thick woodlands or heather moorlands. They are browsers, feeding selectively off the leaves of herbs and shrubs in woodlands or on moorlands.